I love the train and the books. We go out and see different things we can do with our children. We have been swimming, and to Ikea and looked at toys. We went on a picnic to Jells Park. The children really like going out, and we like seeing new things. Our parenting experiences are so different, you can’t imagine the hardships people have faced. Life in Australia is challenging and our playgroups help our refugee families settle in. I’ve learned so much from these women too – seeing their strength and realising you’ve got to relax and can’t always get stuck on procedures. 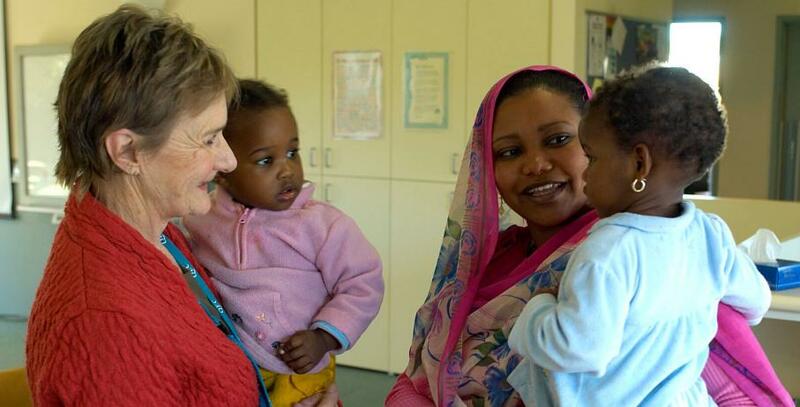 This playgroup is focussed on supporting mothers who are new arrivals from Sudan. We help them make new friends and become involved within the community. The Sudanese group runs every Thursday from 1.00pm-3.00pm. For the Mothers that can not get to group we will pick you up between 12.15pm-12.45pm and bring you to playgroup. During the term we have planned outings as well as representatives from services that come into the group to visit and provide information and education.